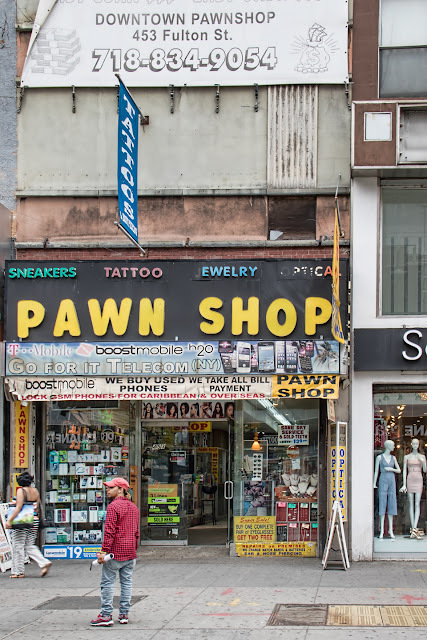 A pawnshop on Fulton Street in downtown Brooklyn. It's worth enlarging the picture to take a good look at the amazing variety of services provided -- Sneakers! Tattoos! Gold teeth! Buy one pair of eyeglasses get two free! Watch repairs! Nose piercing! If they threw in dry cleaning and an espresso machine you'd never have to go anywhere else. They also buy used phones. I should have sold them my old iPhone when I had the chance.